The lake level is lower but still6″ too high. I took the new kayak down to the outlet pipe and the county had been there and driven in the beaver deterrent stakes and removed the newly accumulated but partial beaver dam. It is interesting how they generated the deterrent. Tall re-bar stakes were pounded into the earth and in contact with the pipe about every 8″. Then a 3″ diameter log was placed across those stakes in the water so it was just exposed a little bit. I guess the theory is that the beaver cannot get through with the branches as he cannot figure out how to get thru the barriers. Pretty simple really. It was quite windy when I was out on the lake Sunday and the 14′ kayak wanted to weather-vane into the wind. Without the sekg being down it was nearly impossible to keep the thing turned beam to the seas. It always tried to round up to face the wind at about a 30 degree angle to the wind. Anyway it is about twice as fast as the short fat boat I used to use. I tried out my new skirt too and a little leaning to turn the boat. Not too much though as I did not have anyone to help me out if I dumped it. I guess I could have tried much nearer to shore but I will wait until it is warmer and someone is in the water with me to turn me right side up again. This will save time as I learn to scull the paddle to keep from a complete flip. Barry brought the Dagger kayak today and a couple of spray skirts to choose from. We brought it home this afternoon but did not take it our for a trial run. We bought it for a price nearly as much as it was new. The trial run was Friday afternoon late and we made it on Wall Lake. It was rough paddling into the 20 mph winds but then we cruised the shore line all the way around and the going was easier. I have to take it a bit easier because my back is somewhat out of kilter and has muscular spasms from a months old injury received in a fall. My next time out will be when my back feels better. So many rivers so little time. I guess I should have said Beaver Dam again. We were out kayaking again and went down to the outlet to our lake. There, about 10′ in, was the new beaver dam. Water is flowing through but the level to the lake is still about a foot higher than normal summer levels. I guess it is a call to the surveyor again for Beaver remedy. What an eventful weekend and Monday. On Saturday we went over to Bristol, IN to Fluid Fun. FF has the largest inventory of kayaks in the Midwest. It was fun trying on different kayaks even if it was spitting sleet, snow and raining. SAM like the Wilderness Systems Tsunami 140 and it fit like a glove. I tried it but it seemed too tight for my feet but when I put on my neoprene high top boots it fit me like a glove too. When the water recedes we will try them out. On the way back we stopped at Essen Haus for lunch and that pretty much killed Saturday. We had been noticing a slow rise in the lake water level of approximately 3″ per day. By Sunday morning the yard down below was pretty much under water. Late in the day we took the kayaks down to the outlet and discovered a beaver dam had dammed up about 2.5 ft of water. I vowed to call someone on Monday morning. By Monday morning the whole yard up to the building was under water and I started to panic. I called the County Commissioner, Surveyor, and the county highway. Well, action was almost immediate and by the 1400 hrs you could see the lake levels receding. I got a nice call from Ron Smith our county commissioner and we jawed for a long time. He is a canoe buff and did big stretches of the Wabash River. We hit it off right away and he is just down the road! Both my Dr’s appointments went ok and I drove up to GR about 1700. I have gained a total of 20# this winter and now have to lose all of it plus the previous amount so it is 40 # to go this summer. Good goal huh? I guess we like pasta too much. I am here in my hotel room sore, bruised and depressed after my week long “vacation” working on the boat. I imagine SAM feels ever worse after using rubbing compound and then wax over the entire boat. Both of us did not feel like going to work today. I have taken so much ibuprofen that now my stomach hurts. Sort of self pity shows eh? Two people have looked at the boat but no takers. One guy thought the deck caulk was too old (10 years). Maybe it is but it does not leak that you can see. I went to the paddle club bolog and lo and behold I found the April 31 Big Pine Creek run. Who’s face do I see most? My old high school chum Barry. He must have half the pictures in the Kodak EasyAlbum. I recognized him by his hat. It is a “suntamer” and are pretty expensive at $70. I bought one too as I think the will be good on the sailboat as well as for kayaking. After dinner at Russ’s I went to B&N and bought a cookie – Oatmeal and raisin. UMMMM! I have not started eating it yet but will pretty soon. We arrived back at home about 1530 and unpacked the truck and vacuumed it out in the wonderful mid 60’s temperatures. Now the washing is going and we are making dinner. I am also preparing for my trip back to the GR area tomorrow AM. Most of the boat work is done for the May 2 launch. SAM did all of the polishing and waxing while I did the inside work and rebuilt the head water faucets. Now we will have to see if they work OK. I had to use available parts at Menards and Lowes. These parts were of a different size so I may get a surprise when I turn on the water in a month or so. I continue to mess with the electrical wiring clean up and I soldered the bilge pump wires that were just twisted together. Afterwards, I coated the solder joint with liquid tape. The test of the bilge float indicates the pump should turn on and off OK. While down in there I renewed the oil absorbers and mopped the far aft area that had some gunk in it. It is now much cleaner with no loose objects to plug the pump. I have been taking triple of my usual dose of Ibuprofen to ease the pain in my middle back area. I have never been the same since I fell upside down into the aft lazerette last January. This type of springtime boat work seems to aggravate the problem. It also seems like sitting in my chair at work does not help matters either. We spent the last two days painting the boat bottom with VC17 and polishing the hull with a bit of rubbing compound. SAM was the spearhead to these two labor intensive activities. Yours truly spent some time rolling the VC17, re-wiring and soldering the bilge pump wires, checking the engine over, installing the new oil absorbers. Tomorrow it is the shower sumps inspections and Faucet washers for the head. The galley sink faucets seem to work just fine. I’ll probably have to go to Holland, MI to get the parts. I am tired now and need some sleep. Thanks for reading this uninspiring bit of trivia. We made it on time to the boat with most of the gear we intended. The bottom paint line is taped and the new shutoff cable is installed. We did a lot of house keeping and charged the batteries that seemed strangely depleted. It took most of the day to get a full 14.2VDC charge. We ate at Kalico and I had pork chops with greens and okra. SAM had broasted chicken. At this restaurant you get three sides. After dinner we went to Oval Beach to watch the sun go down but it was just a bit cloudy on the horizon to see the sun. IT was our first sundown of the year. We stopped by the coffee shop and then on to the grocery to get fixin’s for tomorrows lunch on the boat. Today we are back to winter weather. We have been under a high wind warning for the past 12 -18 hours and if it were near the water it would be called a Gale. It is my first day of vacation and I am in the house. No kayaking today but it would be fun to try to paddle against the 40 – 45 mph winds just for the experience. I am still loading the truck for the trip to Saugatuck and our boat. I turned the heater on in the garage to ward off the chill. I think most of the tools are in the truck and I still need to put in the ladder and the hand cart but I think that is about it. Now comes the clothes and other old things that can be paint splattered. 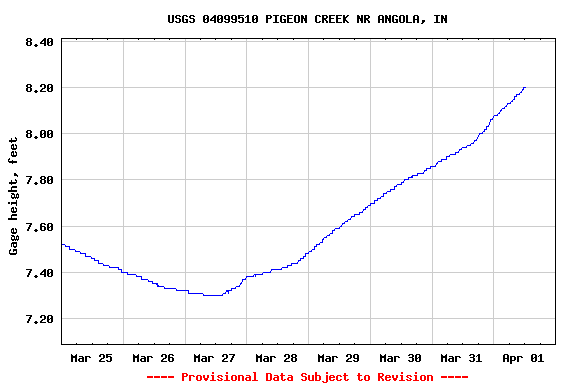 Below is the water level of Pigeon Creek near Angola. This is how I gauge river safety for kayaking. Pretty cool huh? Here is the link http://waterdata.usgs.gov/in/nwis/rt.